One of my favourite things to do is work with amazing clients on a special drawing. 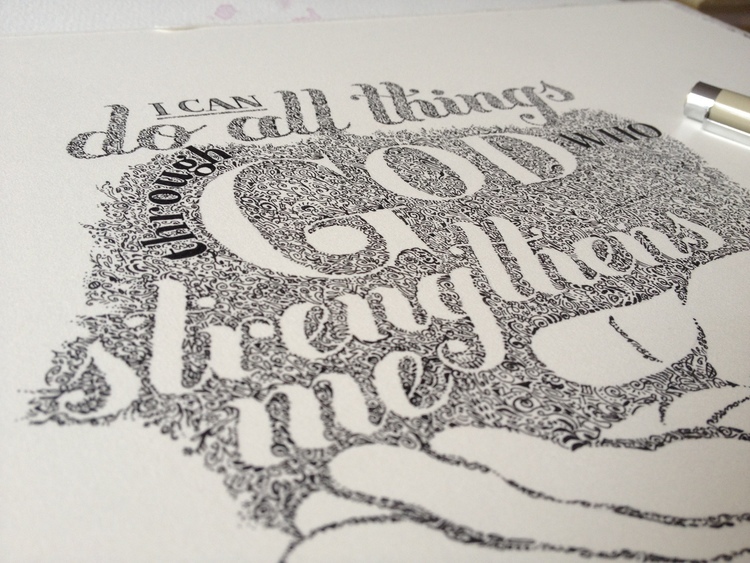 Add in one of my favourite bible verses & an old friend as a client, and it's a beautiful fun process for everyone. I had changed schools and we lost contact, so it was amazing to hear from this lovely lady after so many years. 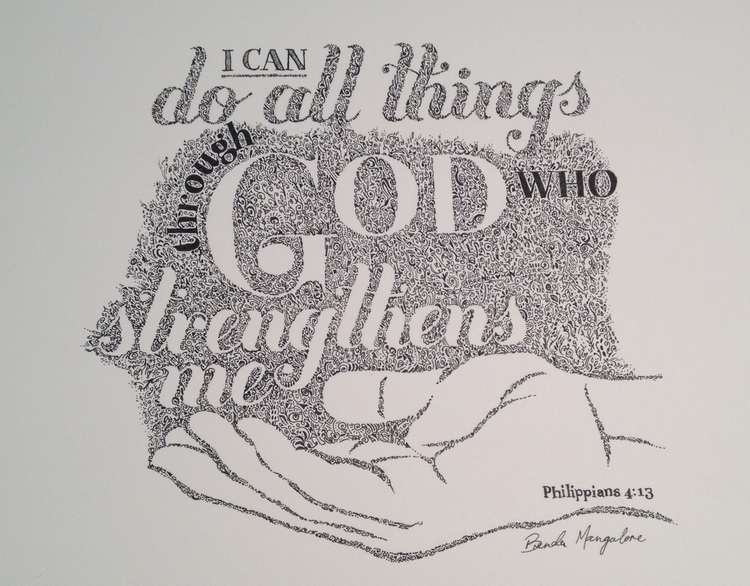 This client needed a custom drawing for her friend's ordination graduation. So a really special event which needed an equally memorable artwork to mark the occasion. For commissions, the client and I make a plan for the artwork. The best clients gives me the freedom to use my expertise to inform the final design, while knowing exactly what they don't want. In this case, Jo wanted to have a hand illustration included with the text. Jo was pretty awesome - she was both flexible and knew what she liked straightaway. This is where we chat tweaks on colour/design/hidden words and check we're still on the same page about the final artwork. Once I presented 3 digital design options, we had a quick chat and the final design was decided very quickly. We decided on the style of illustration, talked about what letters will be silhouettes and which will be filled in. Plus I confirm this is a luxury watercolour paper & ink original. So the fun part can begin! I transfer the design onto paper and that's pretty much the end of the process where I have complete control. That's why I always ensure there is flexibility in the design when I chat with the client for the doodles to work their magic. My job is walking the fine balance & juggle of working within the design boundaries while allowing the drawings to flow freely. Otherwise the drawing will end up looking lifeless and flat. I send regular updates via email, with images and sneak peeks during the drawing process. FINALLY - The artwork is done! When the last line is drawn (and my name & copyright is also hidden inside the doodles) I let the drawing sit and settle overnight. Depending on the package chosen by the client I would do the final arrangements for packaging it up for shipping. Whether that's getting it framed, organising an unveiling, gift wrapping etc.. In this case, Jo just needed an archival mat for the print & we even arranged for an in person pick up so we could catch up! Words are powerful, and I love the way that Brenda makes the words the main event of many of her pieces. I wanted a piece that would underline a significant event in my friend's life, and I wanted it to be a constant reminder to him of the source of his ministry. I wasn't really sure how it would all turn out. I'd seen Brenda's work on the website, but even that didn't quite prepare me for the beautiful intricacy of the finished product - all of those little doodles filling in the piece. It reminded me of the way the body of Christ works: each one beautiful but small and (in a way) insignificant on its own, but coming together in a wonderful tapestry when formed by God. I loved how quick and easy it was (from my end!). It was a very smooth and clear process to transform the kinda vague concept I had into a few solid options that were all so great that it was difficult for me to choose between them. I loved getting updates on progress and it was all finished very quickly. My friend was a bit nervous about my gift because he's not great at pretending to like things, but there was no issue with that here. He loved it! If you're thinking of reaching out to Brenda, Go for it! You won't be disappointed! How sweet is that? Thanks Jo! have a special celebration coming up? Commission your own original drawing! Use inspired words that have deep & powerful meaning for you. Create a personal gift that will be a beautiful reminder of a significant event. As you've seen above, it's an easy and fun process. Taking what Jo said so beautifully, lets work together to form a wonderful tapestry which can only happen when you and I collaborate. Your heart, my hands, together we can create something beautiful. Contact me and we can arrange a (no-obligation) chat!